Parafollicular cells (also called C cells) are neuroendocrine cells in the thyroid which primary function is to secrete calcitonin. They are located adjacent to the thyroid follicles and reside in the connective tissue. These cells are large and have a pale stain compared with the follicular cells or colloid. 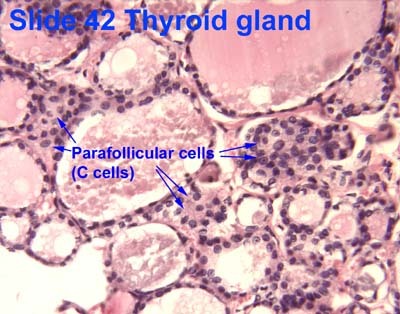 In teleost and avian species these cells occupy a structure outside the thyroid gland named the ultimobranchial body. Parafollicular cells are pale-staining cells found in small number in the thyroid and are typically situated basally in the epithelium, without direct contact with the follicular lumen. They are always situated within the basement membrane, which surrounds the entire follicle. Parafollicular cells are derived from neural crest cells. Embryologically, they associate with the ultimobranchial body, which is a ventral derivative of the fourth (or fifth) pharyngeal pouch. In a series of experiments, neural crest cells were transplanted from quail, with unique and easily identified nuclei, into non-quail neural crest. The presence of cells with quail nuclei populating the ultimobranchial body was demonstrated, which raised the conclusion that C cells migrate during embryologic development from the neural crest. Parafollicular cells secrete calcitonin, a hormone that participates in the regulation of calcium metabolism. It is important in fish and rodents, but its relevance in humans has not been demonstrated. Calcitonin lowers blood levels of calcium by inhibiting the resorption of bone by osteoclasts, and its secretion is increased proportionally with the concentration of calcium. Parafollicular cells are also known to secrete in smaller quantities several neuroendocrine peptides such as serotonin, somatostatin or CGRP. They may also have a role in regulating thyroid hormones production locally, as they express thyrotropin-releasing hormone. Yoko Kameda Y and associates(from 1987-2016)showed that C cells derive from pharyngeal endoderm along with thyroid, not neural crest. Y. Kameda. Localization of immunoreactive calcitonin gene-related peptide in thyroid C dells from various mammalian species. Anat Rec. 219 (1987) 204-212. Y. Kameda, T. Nishimaki, M. Miura, S.X. Jiang, F. Guillemot. Mash1 regulates the development of C cells in mouse thyroid glands. Dev Dyn. 236 (2007) 262-270. Y. Kameda, T. Nishimaki, O. Chisaka, S. Iseki, H.M. Sucov. Expression of the epithelial marker E-cadherin by thyroid C cells and their precursors during murine development. J Histochem Cytochem. 55 (2007) 1075-1088. Y. Kameda, M. Ito, T. Nishimaki, N. Gotoh. FRS2α is required for the separation, migration, and survival of pharyngeal-endoderm derived organs including thyroid, ultimobranchial body, parathyroid, and thymus. Dev Dyn. 238 (2009) 503-513. ↑ Le Douarin, N; Fontaine, J; Le Lièvre, C (Mar 13, 1974). "New studies on the neural crest origin of the avian ultimobranchial glandular cells--interspecific combinations and cytochemical characterization of C cells based on the uptake of biogenic amine precursors.". Histochemistry. 38 (4): 297–305. doi:10.1007/bf00496718. PMID 4135055. ↑ Barasch, J; Gershon, MD; Nunez, EA; Tamir, H; al-Awqati, Q (December 1988). "Thyrotropin induces the acidification of the secretory granules of parafollicular cells by increasing the chloride conductance of the granular membrane." (PDF). The Journal of Cell Biology. 107 (6 Pt 1): 2137–47. doi:10.1083/jcb.107.6.2137. PMID 2461947. ↑ Melmed, S; Polonsky, KS; Larsen, PR; Kronenberg, HM (2011). Williams Textbook of Endocrinology (12th ed.). Saunders. pp. 1250–1252. ISBN 978-1437703245. ↑ Zabel, M (December 1984). "Ultrastructural localization of calcitonin, somatostatin and serotonin in parafollicular cells of rat thyroid.". The Histochemical journal. 16 (12): 1265–72. doi:10.1007/bf01003725. PMID 6152264. ↑ Barasch, JM; Mackey, H; Tamir, H; Nunez, EA; Gershon, MD (September 1987). "Induction of a neural phenotype in a serotonergic endocrine cell derived from the neural crest." (PDF). The Journal of neuroscience : the official journal of the Society for Neuroscience. 7 (9): 2874–83. PMID 3305802. ↑ Bernd, P; Gershon, MD; Nunez, EA; Tamir, H (March 1981). "Separation of dissociated thyroid follicular and parafollicular cells: association of serotonin binding protein with parafollicular cells." (PDF). The Journal of Cell Biology. 88 (3): 499–508. doi:10.1083/jcb.88.3.499. PMID 7217200. ↑ Gkonos, PJ; Tavianini, MA; Liu, CC; Roos, BA (December 1989). "Thyrotropin-releasing hormone gene expression in normal thyroid parafollicular cells.". Molecular endocrinology (Baltimore, Md.). 3 (12): 2101–9. doi:10.1210/mend-3-12-2101. PMID 2516877. ↑ Morillo-Bernal J, Fernández-Santos JM, Utrilla JC, de Miguel M, García-Marín R, Martín-Lacave I (1 August 2009). "Functional expression of the thyrotropin receptor in C cells: new insights into their involvement in the hypothalamic-pituitary-thyroid axis". Journal of Anatomy. 215 (2): 150–158. doi:10.1111/j.1469-7580.2009.01095.x. PMC 2740962 . PMID 19493188.